There are 12 reviews of Relique d'Amour (new). More than a scent this is an experience; it embodies and conveys the idea of entering an abbey or better a countryside abandoned little church. Relique d'Amour opens with a cold, musty feeling, you get the impression of cold stone, of a place whose wood structures have gained a certain humidity during the centuries and are now releasing their particular aroma. It's a fleeting impression though, it soon leaves space to the scent of lilies embraced by incense and resins. It becomes softer and softer as minutes pass, that gothic opening vanishes but a shadow of it lingers in the background, not to play the leading role, which now is kept by lilies and incense, but to set the tone. It's a beautiful scent, much different from many others I have known in many years. It's not an easy one as its top notes create so strange an opening; it's a scent to be enjoyed little by little, like a meditation wine or a very old cognac you taste slowly to appreciate each and every hue. Relique d'Amour is a scent to be savoured with no haste, but it is also a scent that you can wear confidently as it becomes a close mate of your skin, it turns soft and embracing. Sillage is moderate and longevity is about 6 hours on my skin. It's sold in a splash bottle to whose neck you can apply the spray enclosed in its box, so you can wear it either as a splash or in spritzes. A bonus indeed. Non-foody, herbal notes on top. Big pine trees - natural smelling. Heart notes are mashed together. It smells slightly floral, still green, and pale woody. Something a tad salty or oceanic underneath. Ultra slight incense vibe here. Elemi stands out. This all eventually turns into a light green scent and a pale woods scent. It's moss and musk add a gentleness. It's easy to wear. Does not last long on me at all. Well, all we can do is "painting lyrics" in this compelling daily life, ohh poetic friends of mine. Respectfully I disagree with the great Odysseusm (which I appreciate enormously) since I get in here a huge dose of exhaling "lyricism" (no way melancholy despite the mastering struggling lily), humid dampness, pepper (more than enough to be noticed), neroli (quite notable under my vulgar nose), surely pine (with its sort of mentholated-soapy-barber shop and vaguely medicinal feel), probably rose, subtle (magistrally modulated) frankincense and simil-wax or better a lurking lip-stick undiscernible (in its deep substance) undertone in the central and final stage. I get surely that touch of trademark "apothecary" vibe as well, throughout. Surely lily of the valley is the dominant note in here but the floral (earthy-lymphatic) feel is encompassed by a spicy-resinous-musky-dusty cold aura. 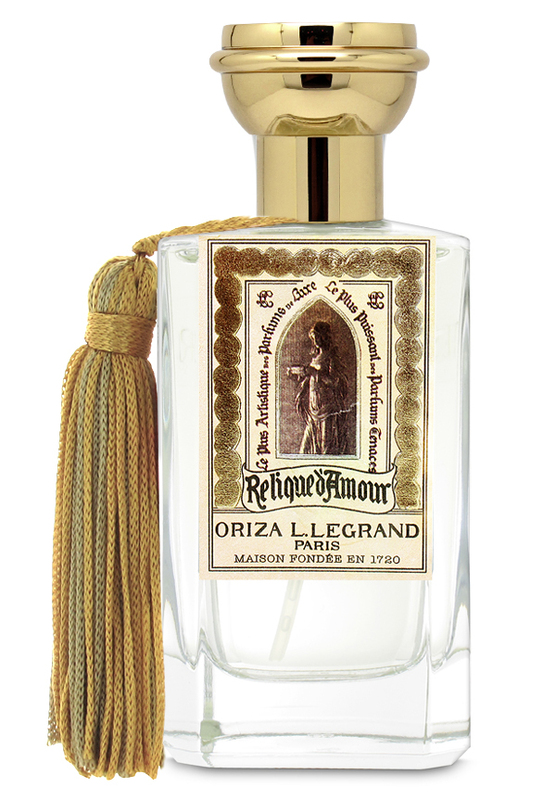 Relique d'Amour starts as a typical Oriza L. Legrand's in style, namely as a freshly (somewhat minty) botanic aroma waving in the middle between Neo-classicism and Art-nouveau. This first bright and splashing phase is aromatic, vegetal, earthy-grassy and musky-spicy. Frankincense is soon present and arousing (as combined with grassiness) a sort of leather/wax-like undertone. I get by soon as well an artistic musky-fougere earthy/floral appeal a la Battistoni Marte Arte, something more contemporary, popular and less properly Art-Deco in style. In this phase I get a resinous-piney-musky grassiness with earthy/floral accents and the overall accord smells refined, conservative, classic and more than vaguely conjuring the 18th century in style (poetry, drama, novels, satire). Pepper, cold grass and pine are responsible about vegetal coldness while dry down is all about florals, woods, pharmaceutical soapiness and musks. Along dry down an impersonal lily of the valley definitely emerges so frosty, weedy, humid, vaguely moldy and woodsy like an isolate little forest next to an immobile gray-dark green lake. The overall olfactory fatigue, in spite of its lack of impressive complexity/evolution, unfolds a quite elegant, romantic, yes stoney-regal (as a scary castle in the middle of the english misty countryside) aura. The regality of floral damp coldness conjures me in style (partially as aroma as well) scents a la l'Erbolario Magnolia or V&A Muguet Blanc. I even get a sort of Askett&English-like lingering atmosphere evoking tedious-weary landscapes, gracious "white-lace dressed" mademoiselle, nobiliar decadent buildings and princely abandoned gardens, a sort of "Dickensian" cold-sinister atmosphere (the Great Expectations' landscapes and cold-gothic buildings come easily on my moonshiny mind). This juice is aristocratic and elusive, more than vaguely forbidding, it could ideally be the perfectly fitting Estella's untouchable scent. I admire the lyricism of the reviews to date. My impressions are more prosaic. First, and problematically -- I get NO pine, incense, woods or pepper. None. Thus, much of my interest in the scent takes a left turn. Second, what I do get is a beautiful lily scent. As others have noted, it is quite realistic and rather charming. Certainly the scent is feminine in style. It starts with a nanosecond of herbs. The lily note is a clean, white floral, a bit soapy. Charming and spring-like, I don't see anything melancholy here. The scent is young in style. "Cold stones"? Maybe. Or perhaps a cool, powdery and somewhat soapy chord, like Ivory bar soap. "Waxed wood"? Emphasis is on the wax. So if you want a charming, spring-like lily scent, this is for you. Sits close to the skin. There are no member images of Relique d'Amour (new) yet. Why not be the first?